The Sophia M. Sachs Butterfly House is a division of the Missouri Botanical Garden. You can support the work of the Butterfly House with a fully tax-deductible gift in any of the following ways: paving stones, commemorative gifts, the annual fund, or by becoming a member. The Butterfly House offers special experiences for children. They enjoy aspects of the Butterfly House that adults may not notice, like the jewel-tone carapace of a beetle or the drying wings of an emerging butterfly. The Butterfly House puts great effort into its role as a must-visit destination for families with young children. The Lopata Learning Lab, Caterpillar Corner, and Exploration Station offer daily hands-on activities. The new Nature TREK in the outdoor native garden engages adults and children with nature through their five senses. Special events include crafts, storytelling, and nature walks. Many educational programs, classes, and experiences are tailored for children age 2 to 10. Families can stay an hour or make a day of it. You can help us engage children with the incredible creatures at the Butterfly House. Please consider making a special gift to support our programs and activities. If you have questions or would like to discuss other ways to support the Butterfly House, please call (314) 577-9500. 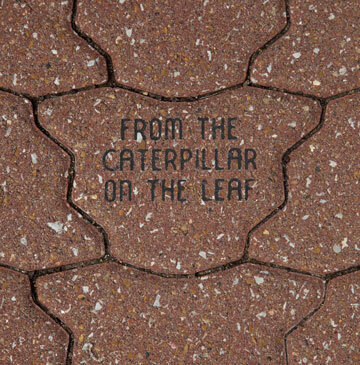 Celebrate an occasion or honor a loved one with an engraved paving stone in the entry court of the Sophia M. Sachs Butterfly House. Donors can engrave three lines of text, 12 characters per line, on the paving stone shaped like a butterfly. Your gift will make every visit to the Butterfly House a personal and meaningful experience. You also support an organization that inspires wonder and teaches important lessons about conservation. Butterfly House pavers are $250 for members and $350 for nonmembers. Order today by using our online order form. For questions or to request a print brochure, please call (314) 577-5118 or email membership@mobot.org. Celebrate the birth of a child; share the joy of a wedding, birthday, anniversary, or graduation; honor or memorialize someone special in your life. A commemorative tribute gift supports the Butterfly House and can be made in any amount. A card acknowledging your gift will be sent to the person you designate; no mention is made regarding the amount of your donation. The name of the honoree and the donor will be listed in the Bulletin, the Missouri Botanical Garden publication mailed to 44,000 member households. If you would like to discuss other ways to honor someone with a gift, such as naming a tree at the Butterfly House, please call (314) 577-5180. Click here to make a commemorative tribute donation. The Sophia M. Sachs Butterfly House is a division of the Missouri Botanical Garden. To learn more about membership benefits, including free admission to the Butterfly House, call (314) 577-5118 or click here. If you are interested in sponsorship or corporate support of the Butterfly House, please contact corporate@mobot.org or call (314) 577-9513. The Sophia M. Sachs Butterfly House is a division of the Missouri Botanical Garden. The Missouri Botanical Garden is a 501(c)3 charity in good standing. Contributions to the Garden are fully tax-deductible.